Citation Information: J Clin Invest. 2007;117(12):4034-4043. https://doi.org/10.1172/JCI32994. Generation and characterization of the conditional ROSA26PTX allele. (A) Diagram of the wild-type ROSA26 locus, the ROSA26PTX targeting vector, the ROSA26PTX allele, and Cre-recombined locus. Black arrowheads represent LoxP sites. (B) Cre-dependent expression of PTX S1 mRNA. RNA from endothelial cells that were isolated from ROSA26PTX mice and then infected with Cre- or GFP-expressing (control) adenovirus was analyzed by Northern blot. Blots were hybridized with probe for PTX S1 and for GAPDH mRNA to assess loading. (C) Cre-dependent ADP-ribosylation of Gαi/o. 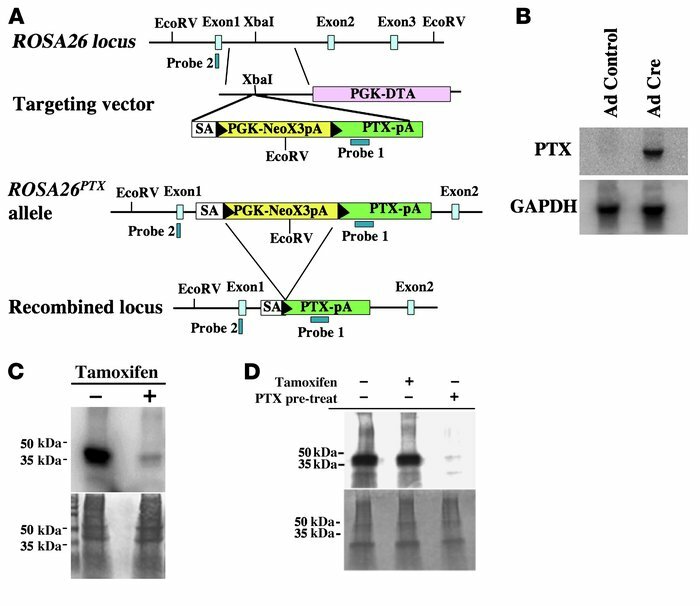 Fibroblasts from ROSA26PTX mouse embryos carrying a CMV-IE-ER-Cre transgene were incubated with or without 1 μM 4-hydroxy-tamoxifen for 4 days to induce Cre expression, ROSA26PTX recombination, and expression of PTX S1. Membranes from these cells were incubated with the ADP-ribose donor [32P]NAD and exogenous pertussis toxin, then analyzed by SDS-PAGE and autoradiography (upper panel) or stained for protein loading (lower panel). Note the absence of Gαi/o available for in vitro labeling in membranes from tamoxifen-induced cells, indicating that ADP-ribosylation of Gαi/o had already occurred in vivo. (D) Cell-autonomous function of ROSA26PTX. Mouse thymocytes were cocultured with Cre-expressing ROSAPTX mouse embryonic fibroblasts (MEFs; as in Figure 1C). Where indicated (+pre-treat), thymocytes were treated with pertussis holotoxin (50 ng/ml). After 8 hours of coculture, thymocytes were isolated, and their membrane fractions were assayed for Gαi/o available for in vitro ADP-ribosylation as in Figure 1C. Note that coculture of thymocytes with PTX S1–expressing MEFs did not cause detectable loss of ADP-ribosylatable Gαi/o, but addition of exogenous holotoxin did.